When I was a little girl, I am told I used to eat ice cream with my Aunt Emily all the time. Although my memories of my youth are fuzzy, I do remember going to Dairy Queen for banana splits and blizzards with her in my teenage years. Like every visit she would make, I knew at some point we’d be making a trip to Dairy Queen. Nowadays I don’t eat ice cream that much but when I do indulge, it’s banana splits all the way. When Mazola Corn Oil contacted me about grilling with their product, I knew I wanted to give their grilled banana split recipe a try. Grilled fruit is absolutely the best. And pair it with ice cream! Perfection. While most grills are too hot for olive oil to handle, corn oil has a high smoke point. This means it is ideal for marinades and protein on the grates, and won’t burn or leave a bad taste. More importantly, it’s a better-for-you way to grill. A recent study found corn oil lowered LDL or “bad” cholesterol more than extra virgin olive oil. The fruit doesn’t take long to grill and that little time on the fire brings out the sweetness of the fruit. Give it a try with your favorite fruits. 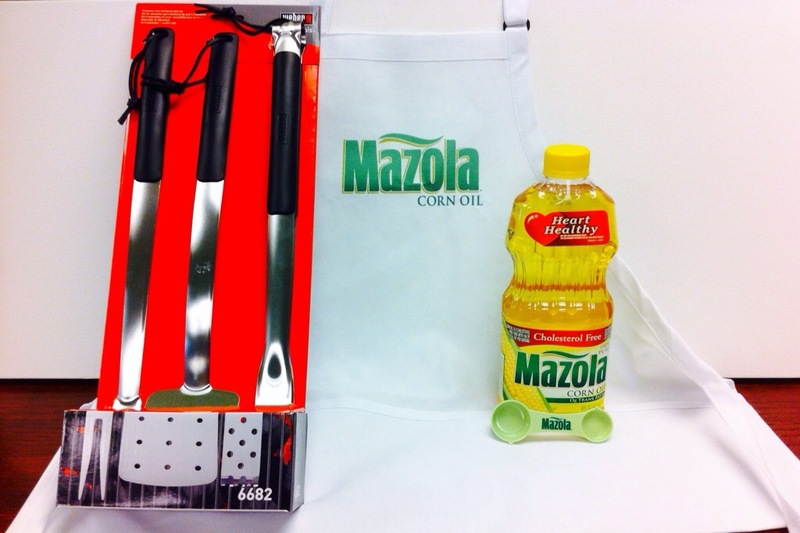 And to help you make some of your favorite grilled dishes this summer, Mazola Corn Oil is giving away the ultimate summer grilling kit to one reader! Mazola wants to be your summertime companion – perfect for spicy marinades and unique grilled recipes. Leave a comment on this post and I will randomly choose a winner to win one kit. Contest ends 11:59 pm August 8, 2014. In a plate or small bowl, combine brown sugar and cinnamon and mix together. Set aside. Cut each banana in half horizontally. Brush cut sides of banana and strawberries slightly with oil using a brush. Brush one side of pineapple ring with oil. Sprinkle fruit with cinnamon sugar mixture. Place oiled sides of fruit down on grill. Sprinkle tops of fruit with remaining cinnamon sugar. Grill 2 to 3 minutes until fruit is nicely browned and slightly soft. Flip fruit over and grill an additional 1 to 2 minutes. Remove fruit from grill. Serve with ice cream, whipped cream and chocolate sauce. Disclosure: I received one Ultimate Summer Grilling Kit to use in the creation of this dish. I'm going to try that! It looks yummy! That banana split looks so yummy!!! ...and thanks for this giveaway! Yummy! Please, please make one for me?! Grilled bananas sound delicious. I'd love that sundae right about now. That banana split looks great. This banana split looks soooo good! Definetly going to try this banana split recipe. Thanks for the info on the corn oil for grilling. 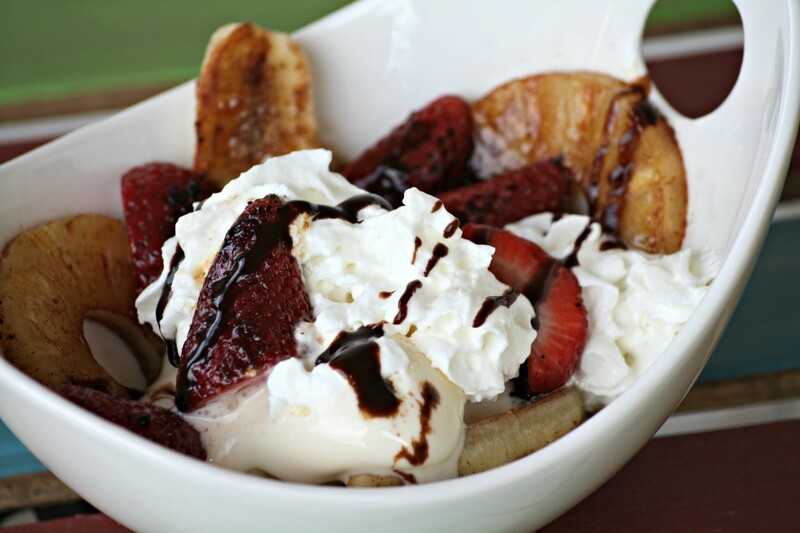 Definetly going to try this banana split recipe. Thanks for the info on the Mazola corn oil for grilling. This is something my sister can make me for my birthday! I bet this tastes as great as it looks.